Ticks are arachnids. They need to find hosts to feed on (blood meals) in order to grow and mature. Most ticks actually need multiple different species of hosts to complete their life cycle. Humans, dogs, and cats normally fall into the “incidental host” category. Ticks evolved to use animal hosts like rodents and deer but unfortunately for us, they aren’t picky and will gladly latch onto other species. HOW DO ANIMALS/PEOPLE PICK UP TICKS? When looking for a new host, ticks climb up blades of grass and hold out their forelimbs waiting for something to brush by that they can latch onto – usually something furry. Their ideal location for this would be fields of tall grasses, but in reality, they can drop off their previous host anywhere. Ticks used to be a fairly rare occurrence north of Toronto but their numbers have been increasing steadily over the past few years. There are many reasons for this but generally the changing weather patterns and varied migratory patterns of animals have brought them to our area. Ticks travel with their host until they are ready to fall off and moult to their next life stage or lay eggs – deer and birds can carry these ticks huge distances. Ok, so besides being gross, what’s the big deal? Ticks secrete a chemical when they bite to numb the area where they insert their mouth parts to start feeding. This allows them to feed uninterrupted without being noticed by the host. Most people don’t even know they’ve picked up a tick until they are showering and feel a “skin tag” where they didn’t have one before. If the tick was just sucking blood and then going away, it would be a bit gross to find one on yourself or your pet, but no big deal. Unfortunately that isn’t all – ticks can carry a multitude of parasitic and bacterial diseases and spread them to their hosts while feeding. There are other bacteria that ticks can also carry and transmit to humans and our pets. Lyme is the most common in our area – so we will stick to describing only Lyme but if you have any questions about the other diseases, please call the clinic to discuss it with one of our veterinarians. Lyme disease is probably the most well-known tick borne disease. It can affect most mammals, including humans, dogs, and cats. 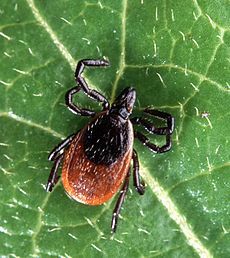 It is caused by bacteria (Borrelia bergdorferi) that are contracted almost exclusively through tick bites. Only certain species of ticks can carry the Lyme bacteria – Deer Ticks are the ones we need to watch out for. Ticks pick up the bacteria from rodents carrying the bacteria when they feed as a larva or nymph. The bacteria enter the tick and when the tick finds its next host and starts to feed, the bacteria enter the new host and set up infection. It has been estimated that a tick needs to be latched on and feeding for 24 hours before Lyme bacteria can be transmitted to the new host – this is why in endemic areas doing tick checks immediately after walking through a problem area can severely decrease the risk of contracting Lyme. In dogs and cats, the most common symptoms of Lyme disease are weight loss, fever, lethargy, and sore joints. If Lyme disease goes undiagnosed, the damage can become permanent and even though we can kill the bacteria, the symptoms may remain. Early diagnosis and prevention is key. This is what leads to our current recommendations for pets. Dogs – if you are in an area where your dog has had a tick before or know there is a tick population, we recommend the dog goes on a tick preventative – Advantix - a once a month topical treatment that will deter the ticks from latching onto your dog. 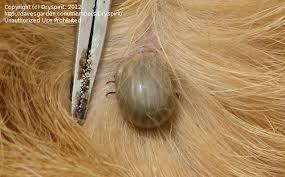 If you do find an engorged tick on your dog, please bring it in to us and we will try to identify the species of tick. If we are worried about tick borne diseases, the dog can return 6-8 weeks later to have a simple blood test that will screen for the most common tick borne diseases. Cats – Ticks are much rarer in cats for a few reasons. With the exception of barn cats, most of our pet cats aren’t wandering through forests or fields where deer might have dropped the ticks off. Secondly, cats are meticulous groomers, so even though they may not feel the bite, during regular grooming they may find the tick and groom it off. This is good because tick preventives in cats are severely lacking at this time. Cats are extremely sensitive to the drug in Advantix so it is very important it is ONLY used in dogs, NEVER on cats. If you do not feel comfortable removing the tick from your pet, by all means, call the clinic and we can do it for you. If you want to remove the tick yourself (or if it is on a person) there are a few tricks to it. The mouth parts of the tick are inserted into the skin – you want to make sure that these mouth parts aren’t left behind. The best way is to use tick tweezers – they grasp the tick right around the mouth parts – gently apply traction until the tick releases. 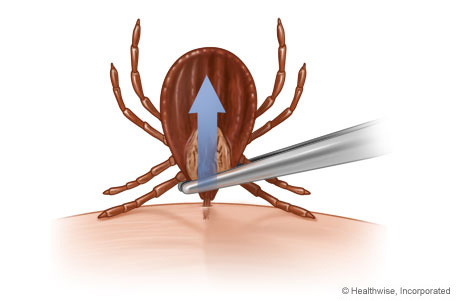 Try not to squeeze the body – you can actually pull the body off of the head/mouth parts and then it is very difficult to go back and get the rest of the tick from the skin.